NATA 2018 was scheduled on April 29, 2018, from 10:30 AM to 1:30 PM. 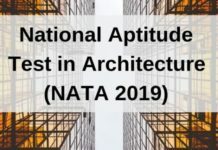 The Council of Architecture (COA) has conducted National Aptitude Test in Architecture (NATA) for admission into B.Arch. degree course. Only those who successfully register for the exam could download their admit card and appeared for the entrance test. Unlike previous years, this time NATA is a single day computer-based test. Get here complete details of NATA 2018 including the application form, admit card, syllabus, result. Latest: NATA 2018 Result & scorecard is available now. Also, Candidates can now view their responses in NATA 2018 by candidate login. Apart from NATA, another national level examination through which candidates can get admission in B.Arch / B.Planning courses is JEE Main Paper 2. The application form of NATA 2018 is to be filled and submitted by online mode only. No other mode of form submission is acceptable. However, firstly, the candidates must ensure that they fulfil the eligibility criteria or not. Then the eligible aspirants can apply for NATA 2018. The application form will be filled majorly in three steps i.e, Personal Details, Document Uploading, and Fee payment. The candidates should follow every step carefully to fill the application form. The candidates need to pay the following amount for the application fee. Can I Make Changes In The NATA 2018 Application Form after submitting it? Mock test for the NATA exam is available on the official website. Candidates can give the test through the direct link provided below. Mock Test: Click Here to give the mock test of NATA. Qualified 10+2 or equivalent examination. Or, the candidates must possess a 10+3 Diploma degree in any stream. The degree must be recognized by Central / State Govt. Or, the candidates should have passes International Baccalaureate Diploma, after 10 years of Schooling. Have qualified a national level architecture exam. In the qualifying examination, the minimum aggregate marks of the candidates should be 50%, with Mathematics as a mandatory subject. The admit card of NATA 2018 will be issued to the candidates who have registered themselves and paid the application fees successfully. The candidates will be able to download the NATA Admit Card at its official website, nata.nic.in. The candidates should not damage or misplace their admit card as it is required at the later stages of admission process also. In case of misplacing or damage, no duplicate admit card will be issued. The candidates must bring the copy of the admit card along with the valid ID proof on the day of examination. The COA allocates test centers to the students on the basis of choices given by them at the time of NATA 2018 Registration. The details about the test center will be given on the NATA 2018 Admit Card. The exam center as printed on the admit card will be final and any request in change in exam center will not be considered. Mode of Exam – Part A will be an online examination, whereas, Part B of the examination will be for drawing (pen and paper based). Language – The question paper will be in the English Language. Duration of the exam – 180 minutes. Part A will start in the first 90 minutes and Part B will start n the last 90 minutes. Negative Marking – There is no negative marking for an incorrect response. The candidates can check question and marks distribution in NATA 2018 from the table below. Ability to sketch an object in visually appealing manner. Drawing from memory through pencil sketch on themes from day to day experiences. In Part B, The candidates will be assessed on the basis of their sketching ability of a given object and rendering it in the similar visual appealing manner. Is there any change in the NATA exam pattern? Considering previous year’s information brochure, it has been observed that the exam pattern for NATA 2018 is same as previous year. Except for mode of exam for Part A, there is not much big change in the exam pattern. 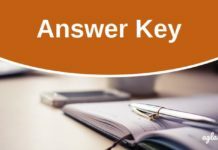 The answer key of NATA 2018 will be released for the Part A of the examination. No answer key will be provided for the Drawing test because it is subjective in nature. 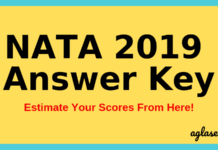 The candidates will be able to use the answer key to assess their performance in Part A and to know how much they will score in the examination. Overall Qualifying marks Overall qualifying marks will be based on post-exam statistics and at the discretion of the council. India Habitat Centre, Core 6A, 1st Fl, Lodhi Road, New Delhi – 110 003. For more information on NATA 2018, you can download information brochure.